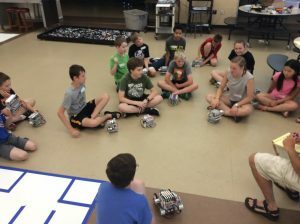 How do you design a robotics camp that pushes the envelope for repeat customers while also keeping the learning entry low enough for new students to feel success? 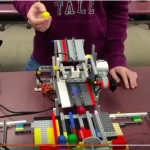 How do you come up with new ways to challenge ALL students in the field of robotics and programming? 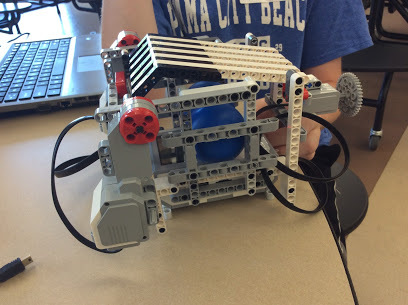 After organizing summer LEGO Mindstorms EV3 camps for many years, we have figured out a successful blueprint that allows all learners to be engaged, challenged, and excited for the world of robotics. We make the newbies feel successful while also challenging our intermediate to advanced students. This allows for mentoring, modeling, and learning from peers. In Bettendorf, Iowa, we have been hosting Robodogs Robotics Summer Camp for eight years. What started out as a small, low-key operation has morphed into something much more powerful. We have learned what it takes to challenge students in their critical-thinking skills, collaboration, and problem solving. We mix in communication and creativity throughout everything we do and this past summer was no exception to the amazing work that students can create and present. I am often reminded that given the proper environment and learning conditions, every child can tap into their innate curiosity and succeed. For our most recent summer camp, we divided up our camp into three-hour blocks of time. What we have found is that shorter time does not provide enough tinkering, prototyping, and problem solving opportunities. Children need time to process, prototype, experiment, and observe the results. When time is cut short we remove the flow time for a student to immerse themselves into their learning. Three hours is about the cutoff when they need a break for the day and can go do other activities and hobbies. A fresh start for everyone. Students realize that all work is simply a prototype. They learn to deconstruct their builds so they can apply previously acquired skills to new challenges. Creates variety in the learning so it does not feel redundant. Provides more opportunities for students to see different ways that robots can be used and programmed. One challenge we face is that many of our students come back every year. We offer our camp for grades 5-8. We have participants that come all four years. We also have a younger camp as well. Each year we must provide new challenges. We must also provide challenges that are scalable to meet the needs of all skill levels. 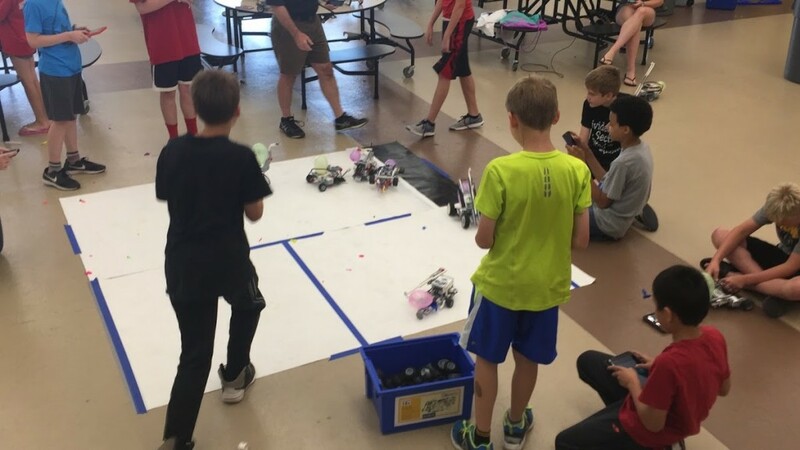 In our middle school, students have robotics class in 6th and 8th grade. Some of these students are also on our competitive robotics teams while some children have never seen a LEGO EV3 kit before. We must be aware of the diversity of experience as well as needs of each learner. Each activity mimics the rubrics used on the LEGO Education software. We use bronze, silver, gold, and platinum statuses to challenge kids. The ultimate goal each day is to have each student earn the bronze. Everything else is icing on the cake. To streamline the process and to help provide support when we have many students and not enough adults at times, we have provided our website as a resource. There are sample codes and video tutorials. These are designed to help them with the beginning levels. There are no tutorials for the gold and platinum levels as those are designed to really challenge. Being educators we understand how important it is for students (and adults) to feel success in order to deal with adversity. In day 1, we had students create a motorized box. 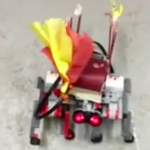 We wanted to challenge the perception that a robot has to have wheels or treads. We designed this challenge thinking it would be simple and easy. This challenge was more about building and engineering skills than coding. We wanted the students to explore the parts and understand how they work together. This challenge was tough for many of them as they worked to build a box. The levels were designed to have them explore the coding options in the software. 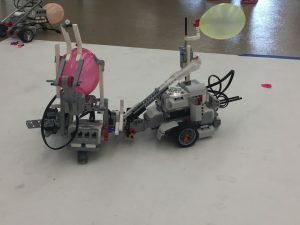 This was a great challenge because even our experienced students had to rethink some ideas as they were used to building a basic robot body to do standard work. In day 2 we moved to one of the kids’ favorites and that is the dragster challenge. This one has so many variables for students to explore that it never gets old. We created a dragstrip that is long enough for them to learn how to deal with weight balance issues, wheels, friction, and gears. We have learned that making the track too short does not lead to the desired learning results we were hoping for. We have found that a track that is a minimum of 15 feet long by 4 feet wide provides the proper distance for stability of the dragster while also providing a good math challenge. The longer track is key. This challenge seemed simple in premise, but was more difficult than they anticipated. We witnessed all types of designs and what was amazing was how the kids learned from one another. They studied the robots moving down the track to figure out how to make their dragsters better. They looked at gears. They looked at streamlining their vehicles. They studied how to keep their robots moving straight and not veer to the side. To challenge our experienced students, we added some coding and sensor elements to really get them thinking. When it comes to our competitive teams, one thing we want them to do is use data blocks to make more precise decisions. This challenge exposes them to some of these concepts. In day 3 we spent the whole session on the gyro sensor. We find it important to challenge the kids midweek. This day is designed to really force them out of their comfort zones. We designed all challenges around using the gyro sensor. If you have some experience with the gyro sensor, you would know how sensitive it can be and all the ways in which it won’t work for a student. The aim of this day was to get them to have their robot learn to make decisions. We did not want simple move blocks to do the challenges. We provided tutorials on how to troubleshoot. The goal of this day was to really learn how to deal with setback and things not working. This day was the toughest for them. By the end they were spent and ready for something new. Many had to build new robots because the design of a dragster to move straight is not the same as a robot that needs to turn effectively. In day 4 we moved into fun challenges. We wanted a day of fun after a stressful day 3. We had them use their phones or tablets for this challenge. We took a break from programming and explored more building design. In this challenge we added a balloon to their robot. We provided each student a push pin to attach somewhere on their robot. The kids learned how to build an effective robot to go around pop the balloons of others. There was some serious thought about being agile enough to move around while also being strong enough to not break down in the arena. We had an underlying goal with this day. Students LOVED this day, but they wished they could do more with the controls from their phone. They started to question how bluetooth works. They wanted to do this or that. As we did individual battles and team battles, you could start to watch gears turn in their head. In team battle, they discussed strategy and concepts to use to stay alive. It was simply AWESOME! Finally, the coaches entered the arena with their robot and I had a robot that was being controlled by another EV3 brick. I was teasing them for what was to come the next day. They were intrigued and curious. In day 5 we ended on a good note. We gave the kids two bricks. They learned how bluetooth works and created their own joysticks for their robots. No phones or tablets allowed. They built their own code to do what they needed the robot to do. We had two challenges. We did a racetrack challenge where each partner had to drive one lap and they realize how difficult this could be. Finally, we ended with a massive soccer match. The kids LOVED this challenge. They had so much fun. Before we knew, it was time to clean up and disassemble robots. What I love about these challenges is that there are no wrong ideas. We provided each kid their own robot so they can bring their own ideas to life. However, they spent so much time sitting at a table and the arenas working together that collaboration naturally happened. As it should. This is a model of a camp that we will use for years to come. It works and is quite effective in ensuring kids feel successful while having fun. More importantly they are learning things that nobody is providing them. This is what camp is all about. If you are interested in learning more, then please check out our website where we have provided everything. We hope you find it useful and just ask you give proper credit as it took many hours to package all this together. You can find me on Twitter @coffeechugbooks and my website www.coffeeforthebrain.com.